I have had quite a few commissions for children’s nurseries over the last two months, but I have particularly enjoyed working on the illustrations that contain the jungle animals theme. 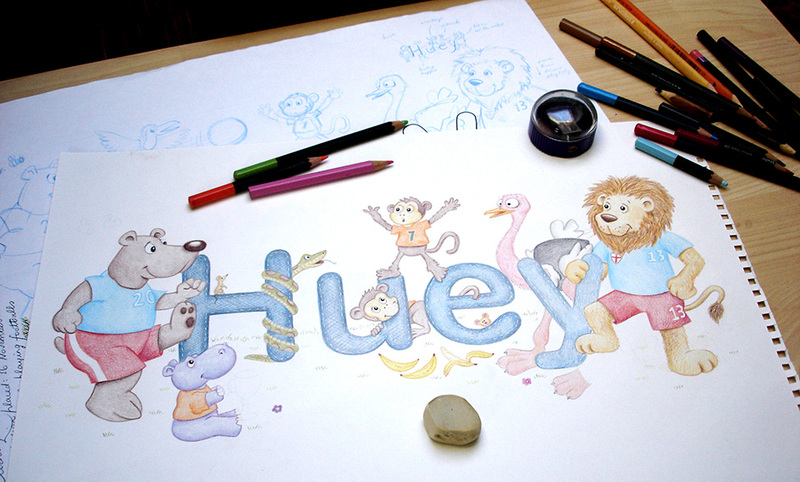 One such illustration was for a little boy called Huey, whose Grandmother, Linda, had commissioned me to produce. Huey is an adorable little boy and is already (despite his young age) keen on a game of football, so jungle animals playing football was the theme of the illustration. I chose a range of animals that Huey would know and recognise, a bear, lion, hippopotamus, monkey etc and dressed them in football kits. I sketched the illustration out in half a morning and worked out what colours I was going to use. One of the stipulations of the illustration was to keep the colour green to a minimum, so that had to be held in mind when choosing the animal characters. During the final colouring stage, I was just colouring in the baby hippopotamus, when my good friend, Mary, rang me to see how I was doing. “What are you doing today, darling?”, she asked. “Well, at this very moment in time, I happen to be painting a hippopotamus’s bottom” I replied. Fortunately, my drawings are not life size or on this occasion she would have been right.